Do You Know that you can search just this Bradsby book by using the Bradsby button in the Partitioned search engine at the bottom of the Current What's New Page? The south line of this township rests on Sullivan county. The State line and Sullivan road pass through the township, following along the valley of the south branch of Towanda creek. 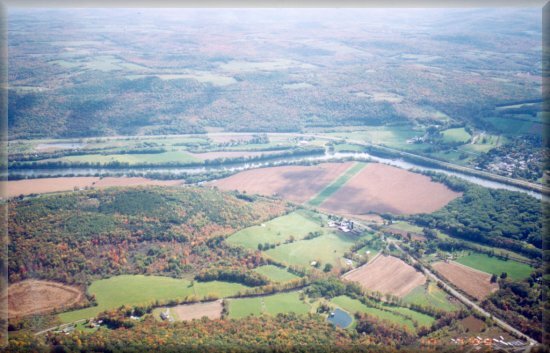 The first settlers located on the Fowler branch of Towanda creek in 1800. They were: Ephraim Ladd and his sons, Horatio, Charles W. and John; Joseph Langford, Jonathan and Rodgers Fowler, brothers. In 1801 Sheffield Wilcox and his sons, Freeman Rowland and Sheffield, Jr., Edward Warren, and a man named Granger came. Ephraim Ladd cleared the first spot in the township Horatio Ladd settled near New Albany in 1805, up to which time there had never been a wagon up the creek. Charles W. Ladd built a stone house at New Albany in 1819. The same year Horatio Ladd and Daniel Miller built. Charles W. was the first postmaster at Albany, in 1820. Joseph Langford, after a short stay, left the settlement. Sheffield Wilcox, Sr., improved the Amazi Heverly place in 1801. .His children were: Andrew, Thomas, Louis, Freeman, Rowland, Eunice, Sheffield, Jr.,Desire, Amy and Jeremiah. Capt. Brockway owned the Connecticut title to the township. Joseph Priestly has the Pennsylvania title. There was but one house between the Fowlers' in Monroe and Mr. Wilcox's place, which was John B. Sanders'. Mr. Granger, who came with the Ladds, settled on the top of Wilcox hill, cleared a piece of ground, went back for his family and died. His sons, Calvin and Dorus, came on, but after a year or two went back to Vermont. Daniel Miller came in 1801, and located where his son Russell afterward lived. John B. Hinman was one of the early settlers, a son of John Hinman, of Wysox. A sawmill was built on the place where he settled. He sold to Humphrey Goff in 1810 , Goff sold to Freeman Wilcox. Jonathan Frisbie came in 1803, and settled on a tract near the Eilenberger pond, building on the knoll just above the spring... William Lee came in 1810, stopping with Jonathan Frisbie until he built his own cabin. He removed to-Hibbard Hill in 1824 ... Amzi Kellogg came in 1812, and built a log-house south of the Wilcox tavern, afterward be went farther south in the township ... Archelus Luce came and settled west of the turnpike, beyond Kendall's mills ... William Miller came in 1817 and improved the Stevens farm. John Forggerty came in 1819. His name was said to be William Bowlin he deserted from the English army and took his mother's maiden name.. . John Nicholas came in 1819, and settled on the hill east of New Albany, on the George Lenox farm-. Nicholas was a basketmaker ... Simeon Chaplain came in 1813, when a lad sixteen years of age, and worked on the Berwick turnpike. He afterward married Mr. Nicholas' daughter, and settled on the hill east of New Albany ... Peter Steriger came in 1824, and settled on the farm that became the Russel Miller farm .... Hugh Cavanaugh came in 1830. Previous to many of the settlements above named, the French had made several clearings, and put up several cabins. These were all in ruins when the Ladds and Wilcoxes came in 1801. Henry Hibbard came in 1827, and settled at what became Hibbardtown; cleared a large farm, and built good buildings. . . . David Sabin, Silas Moon and James Allen. were early settlers. The first sawmill was built a. little below Wilcox's Tavern, in 1820, by the Wilcoxes; a sawmill is still on the same site. . . . Mr. Miller built one about the same time, where the old French mill stood. The heavy timber along the creek soon caused a number of sawmills to be built. . . . The old Berwick and Elmira turnpike road passed through this township, and was largely built through this locality by some of the settlers above named. This road was built through Albany township in 1819-20. It was projected by those who owned large bodies of land, for the purpose of reaching them. The State had made a grant of 287 1/2 acres of land to aid in its construction. The company forfeited their charter in 1847, and it became a public road. . . . Louisa Alden taught the first school in 1812. New Albany Village is the most important point in the township, and is a shipping point on the railroad. Here are a postoffice, store, church, Odd Fellows' Hall, and about twenty-five buildings. Laddsburg is a station on the railroad, and has a large sawmill. Evergreen is a station four miles north of New Albany.